Card Text Play: Return each other friendly Brobnar creature to your hand. If I’ve taken control of an enemy Brobnar creature, does it also go to my hand? No. When cards that changed control leave play, they always return to their owner appropriate out-of-play area (such as a hand, deck, archives, or discard pile). In this case, the creature would return your opponent’s hand. 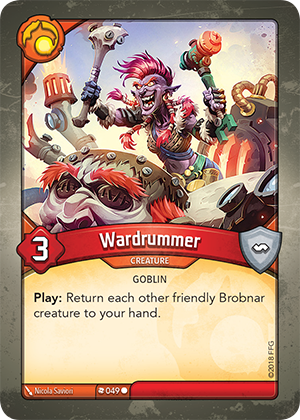 Does the Wardrummer’s “Play:” ability include Brobnar creatures from my discard pile? No. Unless an ability explicitly references an out-of-play area (such as a hand, deck, archives, or discard pile), that ability can only interact with cards that are in play.